Taken at the end of the day, on the way out. A must have souvenir photo. Windy today and it rained, hence the hoodie! So we went to Lollibop today and like Annie, from Mammasaurus Blog I would like to do an honest account of our day - Mammasaurus' review of Lollibop 2013. Fi from Childcare is Fun has written an excellent review of Lollibop 2013 which is well worth a read if you are going this Sunday. Jennifer's Little World - Day at Lollibop 2013 shows a fun filled day at this year's Lollibop in the Olympic Park. 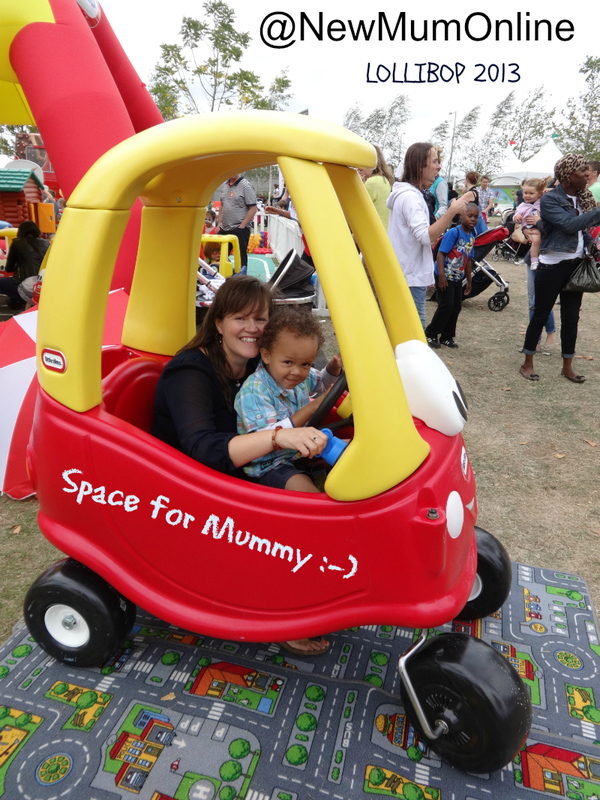 For a very comprehensive review from someone who was not at all disappointed by Lollibop 2013 read this post by Family Four Fun. It is so thorough that even if you did not go you will feel as if you were there: Lollibop 2013 by Family Four Fun's Emily. Over to me; my review. Based on a Mum, Dad and 3 year old boy attending. so excuse the lack of photos in this post - it will be rectified! I've stayed up till 3:20 a.m. to upload all of my photos to G+ THE ALBUM IS HERE. I will decide what to include in this post tomorrow. And so to bed! (1) the Olympic Park WASN'T where I thought it was. To get to the venue, it's a 10 (brisk) or 20 (slow) minute walk. Fi from Childcare is Fun found it to be a 30 minute walk with 2 littlies. Luckily for me and Aaron we had Daddy with us to carry Aaron when necessary but I think he walked the majority of it, so it is doable, as he is only 3 years old and we had neither buggy nor stroller with us, which I am glad about as I'd have pushed it round empty all day and the terrain wasn't suited for it anyhow. I have found a photo of Daddy carrying Aaron, so perhaps he did not walk it all after all #MemoryFail. During that walk, you pass about 50 volunteers and they were SO excited So friendly SO warm and just quite frankly AWESOME. They were giving out directions, high fives, jokes a plenty, and just general love & light! I wish they'd also been at the festival to be honest, as it was lacking that warm "Disney" vibe. Lollibop take note and book THEM for next year, or get them to train your event staff LOL. (2) thank God we were competition winners, as the normal queue was LONG, I mean VERY long. So when I saw lots of people arriving inside the festival at 12:30 and wondered why they had overslept on such an important day, maybe they'd been stuck out there. If you are press/VIP/Blogger/competition winner, you get to walk straight passed the long queue (reminds me of my nightclub days) and join a VERY short one, which means you more or less go straight in. Getting off the beaten path away from the crowds and stalls recharges your festival batteries. Aaron and I simply LOVE open spaces! Not being in the long entrance queue. Was fast tracked in as a competition winner (same queue that press, bloggers, and VIP go in). A delicious hog roast burger and a beer at about 11:55 a.m.
Daddy being on hand to help with Aaron - what a difference THAT makes, compared to when he's at work, and I do it all alone. Getting some photos I was really happy with. Feeding delicious hot dogs to Daddy and Aaron, and seeing how much Aaron enjoyed his. If you see people with them they look crusty but they are NOT. On a day when we spent a lot, it was really convenient and much appreciated to chill out and have two free instant coffees in the Mummy Blogger tent. Daddy (due to the wind and rain) even asked for a sweet tea and really enjoyed it. Loved spending quality time in the Little Tikes area pushing Aaron's car around. Aaron is slightly too large (he's a TALL boy) at 3, for a classic Little Tikes Cozy Coupe, so if we win the competition I entered there, then I want to win the Little Tikes truck, as I really enjoyed pushing him around in it and it was the perfect fit, as it is slightly bigger, and more grown up looking. Here's hoping. Loved seeing him enjoying the WOW toys, who until today I had never heard of before! Loved running out of and sheltering from the rain. Such fun. Loved watching Daddy roll down a hill on the grassy bank we found by accident . We followed a sign for Lolli Promenade and ended up by this grassy bank where parents were running up and down the hillside #SimplePleasures - everyone else was running down the hill but Daddy decided to roll. It was so wonderful seeing him get in touch with his inner child. After the hectic vibe of getting there and getting in, and worrying about taking it all in, it was lovely to relax and watch Aaron playing in the London Underground thingy majiggies, also by the Lolli Promenade. He is asleep so I cannot ask him, but I know hands down he was TRANSFIXED by the robot - Titan (pictured above) - who did a performance the minute we arrived. I'd say about 150 people watched this, but it was so so so awesome, I think a lot more people should have got to enjoy it, but it was quite early so not everyone had arrived yet. It wasn't just the movements that were captivating but the script; it was phenomenal! I can't work out from the website if he is there Sunday - sorry people. If he is anything like today, it is early, so don't arrive in the afternoon! Daddy likes to have me time, so he sat at a picnic bench all the while we were at Little Tikes, which meant he was a very chilled cheerful Daddy next time we saw him (as like I say, we spent A LOT of time there). Daddy also likes, in any given situation, to get away from the hustle bustle so he LOVED the mummy blogger tent. He had a sweet tea which he loved (and he doesn't even drink tea) and he read a free magazine with Aaron. Aaron was chilled in there too. Daddy liked it in there so much that when we were in Lego Duplo at the end of the day, he went in there again LOL. The man on the door was nice enough to let him in which I really appreciated. Daddy hates crowds but was in a great mood all day, as we had the break to have beer, the break to eat lunch, the break to roll down hills and the break in the Mummy Blogger tent. Oh and I sensibly allowed him to go to Greggs in Westfield Stratford in the morning, instead of making a hungry Daddy rush straight to the venue which I know he really appreciated. We got the right mix of hectic and relaxed all day I think. It is a happy house here tonight and both of my "boys" are asleep! He definitely LOVED the Little Tikes area. Their poster says they do 20 minute sessions, but they are actually 10 minutes, so each time, Aaron had never had enough, so each time we went straight out and queued again. Each time, the queue would be emptied by the session going in after us, so as we'd be walking out they'd be walking in, so we'd end up at the front of the queue again. So our queueing time was max 10 minutes. One time, we took a red jacket off and then got the last blue one so did not queue at all LOL. He went on the Little Tikes cars etc... for sessions a total of SEVEN times. Total addict. I hope the team there see our photos and see how much we both appreciated it, as I know they found his reaction to getting off quite testing. Funnily enough, the 6th and 7th time he took the waistcoat off and left no bother, as he finally knew the score. He also LOVED the Wow toys area (pictured above) and spent quite some time there, really enjoying their range. I wish we'd heard of them before. He took a while to warm to going into the Lego tent but once he did he loved it in there. If anyone recognises him from these photos, yes he is the boy who had a little scuffle with a girl. Sorry about that. He was on his best behaviour after that.... eeek except for wanting to play with the STRICTLY DISPLAY ONLY lego, but that was because Jake and the Neverland Pirates was in there (as above) and that is his ABSOLUTE favourite TV show - we watch Disney Junior A LOT! The above set is new for August 2013 and I have now promised it to him for Christmas. He loved eating his lunch under the circle area near the main stage. God knows what was meant to be in there but it was empty and we made full use of it. Overall we had an EXCELLENT day. I have said to a few people on Twitter that I was disappointed. I was, but I can't quite pin down why. I think as we are not festival goers, we expected more "rides" and there weren't any. In such a big venue, Aaron wanted to explore explore explore so there was NO CHANCE of pinning him to a stage, so we didn't watch anything at all like that, even though he can sit through a movie at the cinema. I think my issue is it was 8 or 9 out of 10 and I expected it to be 15/10. If I had paid, I would have expected to be blown away, and I wasn't but I was chilled, happy and satisfied, certainly by the end of the day, when we'd taken it all in. We left in such a good mood, that instead of wanting to charge home, hubby was happy to go to Westfield Stratford so that Aaron could ride in their famous red cars, which he did for a few hours. I think that says it all, that we had the capacity to do that after such a busy day. It means we didn't run ourselves ragged, like I said earlier, as we had the right mix of chill out time, which seemed to happen really naturally like a flow. Only problem with going in to Westfield Stratford is that we spent 30 pounds in the DISNEY STORE!!!!! Parked the car to check out the kitchen bless him! He had a riot in the Tikes Town - we did 7 sessions in there! Disclosure: my entrance was a competition win, so I did not pay. ALL words are my own. A super in-depth review and many thanks for mentioning my post too you little love muffin. Off to see your photo on G+ now! Hope you like the photos on G+. 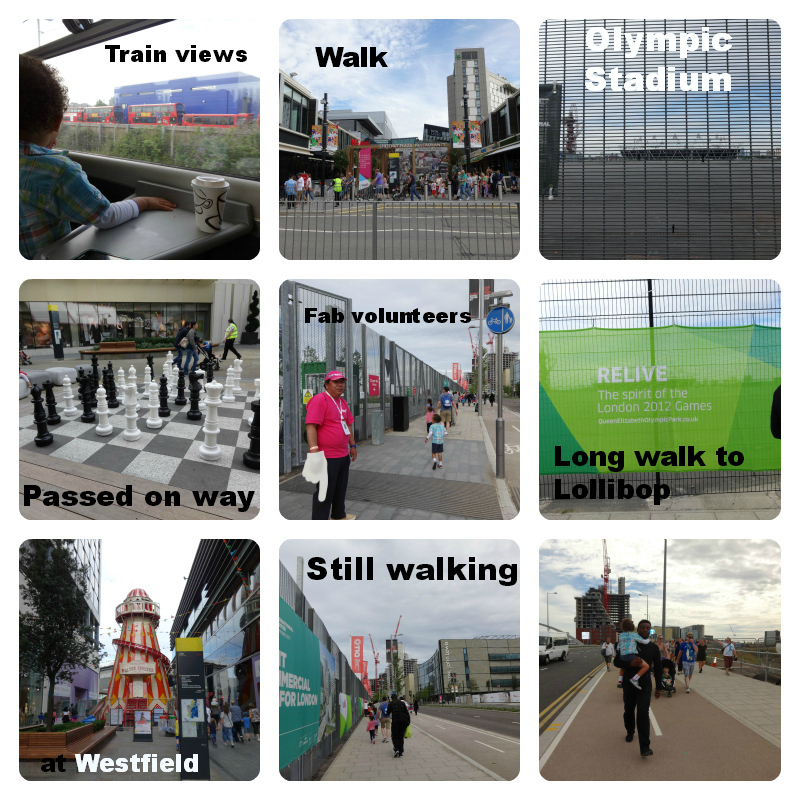 After being at the festival all day and an early start, we then spent a few hours in Westfield Stratford. After all that I should have had an early night but no, I stayed up till 3:20 uploading 211 photos to G+....... so there's loads more there than here. Actually 3:20 was when I turned the computer off, was probably 4 a.m. when I got to sleep. Thanks for visiting and commenting. Love your honest review. I think I shall wait until my lad is in before looking at any more photos - he is going mental! We could NOT handle that queue - no way! My boy would have wet himself and had a meltdown before we got in! would be interested to know if they had anything in place for those with special needs. The toys look great for the youngest - loving the castle. Thank you for linking to me! What wonderful photos! I'm glad that you had a nice day :) We loved the Little Tikes area too, unfortunately we discovered it later on in the day, I wish we had gone there first! I can't believe the queue to get in, that's awful, fortunately as we had bought tickets through Little Bird we had no queue at all. Can't believe we missed the London Underground thing, mine would have loved that! Oh the London Underground thing was off the beaten track. You followed a line for the Lolli Promenade and passed a disco and then it was there on the right. Further down on the left there was a tall grassy bank which kids and parents were running down like something out of Little House on the Prairie, and the hubby decided to go to the top lie down and roll down it. I videoed it but I think he would kill me if I put it online. The Little Tikes area was great but it was impossible to pull Aaron away. We were happy to do whatever he wanted to do though so it was fine. Well done, honest and open but not negative I think. You, like us, went to go with the flow and not pack as much in as possible. 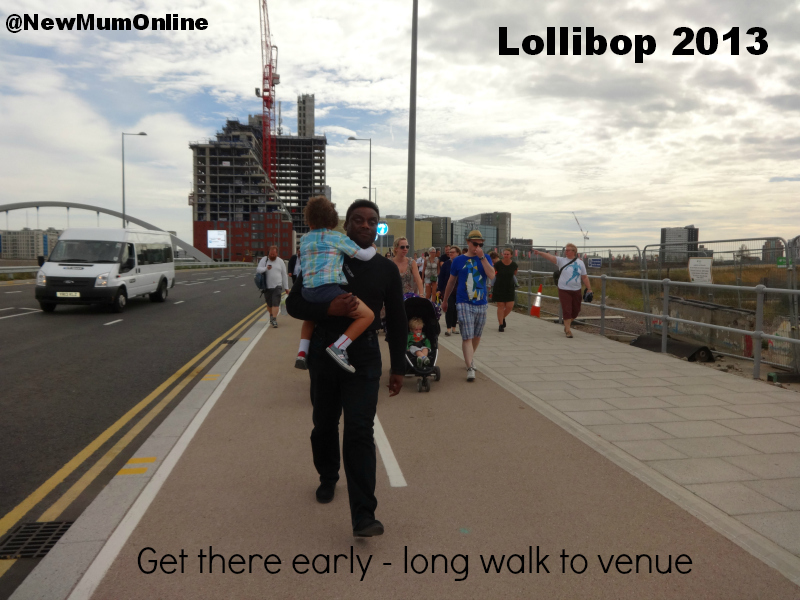 I think the lasse faire attitude is the best thing with LolliBop, and let the children lead the way. Don't know about the negative as I will freely admit it WAS MISSING the magical festival feeling and I want to be honest and open about that. But I HAVE to admit we had a very good day as we did. It was an AMAZING day out for Aaron. We had a VERY different day to others as we were not watching celebs (didn't go near the stages) as Aaron wasn't interested and hasn't watched CBeebies in well over a year. He watches Disney Junior every day, and his current fav is Jake and the Neverland Pirates (closely followed by Doc McStuffins and Curious George), which is why he loved the Jake lego set and could not at all understand that it was display only - naughty Lego for not putting it behind glass high up out of reach if it was only for the adults to look at. It's released in August so I have promised it him for Xmas now. God I have gone off on a tangent sorry. The London Underground tents are adorable! I liked it, but if I had paid over £100 for tickets I wouldn't have been so happy. Competition wins makes things much better! Wow!! Still looks like a great time was had even if you were a little disappointed. I would've been disappointed if I'd paid full price for tickets but not if i'd got an advance offer (£110 full on the door)!! My sister felt like you not 100% sure why she didn't LOVE it (she paid to go) she thought part of it was that she wasn't a fan of this sort of event without children - looking back she said her daughter had a wonderful time and isn't that the main thing? I think I should've sent my hubby off to chill a few times as he regularly got closer to a tantrum than any child, next time I'll follow your lead on that!